It looks like you've recently opened the beautiful world of programming for yourself and chosen Python as your first language. That's actually a wise choice. Or maybe you’re a novice Python programmer who's recently discovered CheckiO and decided you like it. But perhaps you have found the missions rather challenging and feel they can be a bit too hard? Well, from now on, CheckiO is partnering with Treehouse, so you can now go to Treehouse with our special partner discount to ramp up your basic Python coding skills. When we were building CheckiO, our main goal was to build it so that people can learn and have fun at the same time. So when we partner with someone, we ensure they've got the resources that make learning code basics fun as well, and that’s why we chose to partner with Treehouse. Once you’re done with the basic Treehouse Python courses, then we come in. Through Treehouse, you will become familiar with basic Python stuff like strings, modules, and maybe even classes. Taking on CheckiO missions will be the best way to fine tune the skills you now have! And maybe you have friends who have recently started learning Python? Have them try Treehouse, and once they've got the skills they need, they'll be ready to take on CheckiO too. So, if you feel that you need more basic practice, head over to Treehouse. 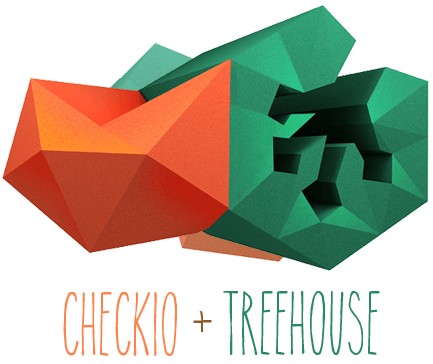 CheckiO players get their first month at Treehouse on us for free! But that's not the only cool and useful announcement we've got for you! We recently published a detailed F.A.Q in our forum which should help give you all the tools you need to keep your adventure in CheckiO going strong! This F.A.Q features a set of super helpful articles which outline common mistakes Python programmers typically make, provide detailed and step-by-step instruction on how to create your own mission and even provide some community guidelines! As always, we're always open for suggestions and additions. So please feel free to express your opinion and help us make CheckiO better for you.